Hello everyone, I am back from my very first trip to the US Virgin Islands. There was plenty of fun in the sun, but as usual I was excited to try the food! We were staying on the island of St. Thomas at Point Pleasant Resort and our villa was right on the ocean in Water Bay. Another cool thing, is that our unit featured a full kitchen which made me very happy. So I decided to do a combination of cooking Caribbean dishes and visiting local eateries. One thing I wanted to do was to get some fishing done in the Caribbean. After checking the listings for fishing boats we found that many charters were very expensive and out of the budget. As a cheaper option I decided to hit K-Mart and purchase my own fishing pole and equipment which totaled about $50. The results were immediate, as day one we bagged two red snapper which I stuffed with cilantro, garlic, and lemon for a really tasty fish roast. The next day we took a ferry over to St. John for the day for some sightseeing. 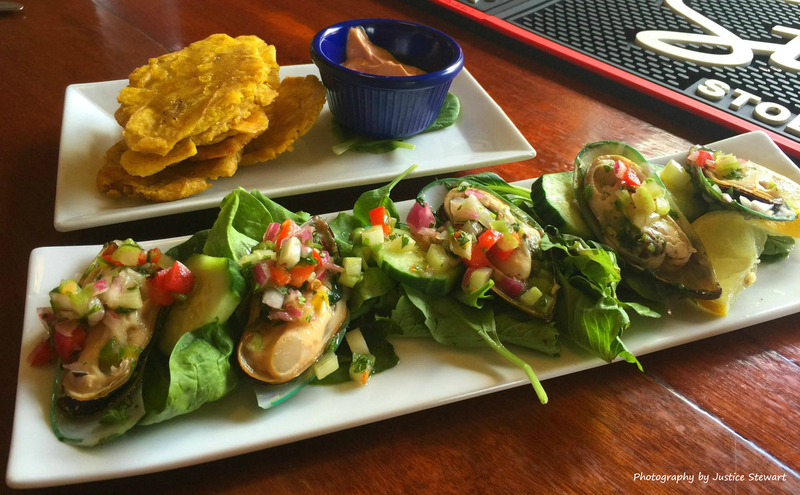 We had lunch at a cute place on the water called Sweet Plantains Restaurant which served up some really good wings and jumbo mussels with tostones. The bartender was very friendly, and he was also from the states and gave us recommendations for restaurants serving up authentic island cuisine. We returned to the resort and decided on having a few drinks at the Shoreline Bar & Grille which is on the property that is owned by my new friend Peter Bontekoe. He and his staff encouraged me to fish from the restaurant dock that evening. My third cast out and I landed a nice 5 pound mangrove Snapper to the delight of the bar’s guest and staff that were observing me fish, Thank you Shoreline bar and grill! We had dinner at the restaurant after my big catch and saved the snapper for dinner the next night (which I fried). 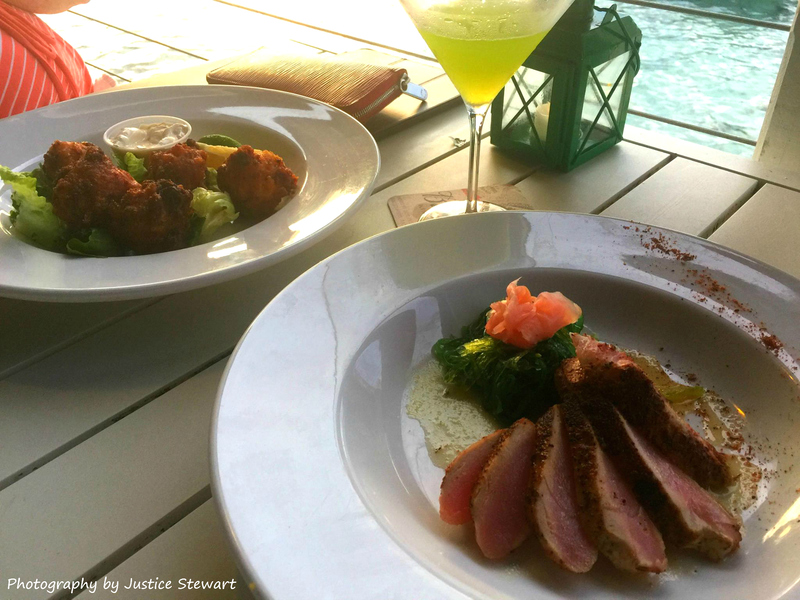 The Shoreline served us some delicious Ahi tuna and perfect conch fritters. The next afternoon we headed to Charlotte Amalie for some duty free shopping. I was given a recommendation to visit Glady’s Cafe for authentic Caribbean soul food and while searching for it we came across Cuzzin’s Caribbean Restaurant. The conch creole was absolutely amazing and so was the Oxtail dish that Emily ordered. I highly recommend this restaurant it you are looking for some really tasty cuisine that utilizes local ingredients. 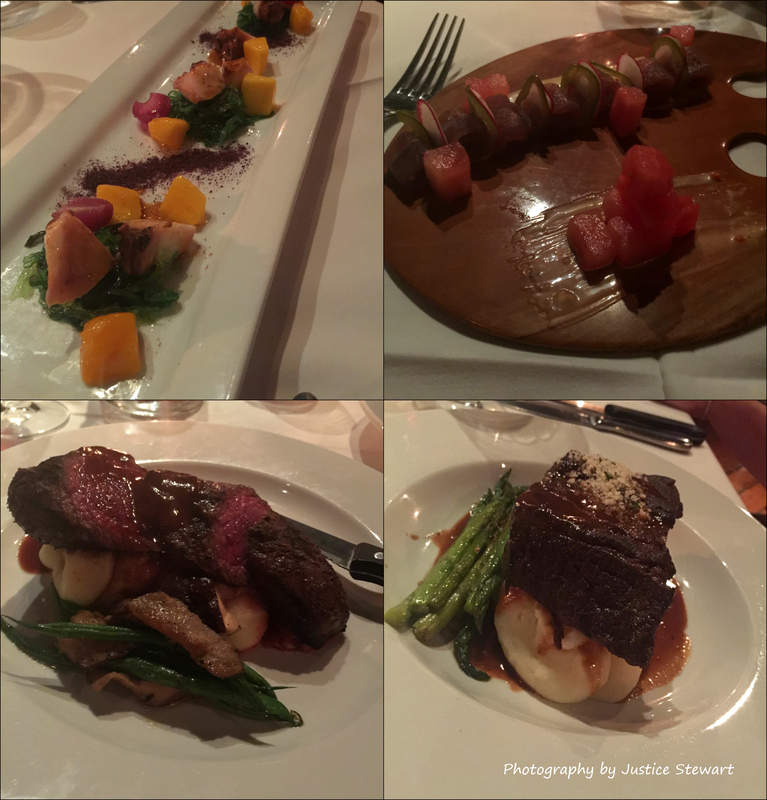 Next up is what is labeled as the best fine dining on St. Thomas, Old Stone Farmhouse. I’ll start by saying Old Stone Farmhouse is a lovely, beautiful, delicious restaurant. The location is hidden and private. The ambiance is rustic yet sophisticated. The menu is exciting and the food we ordered was wonderful. They sent out a complimentary amuse–bouche of smoked local fish in a delicious broth. I ordered the Waygu Bistro Steak with haricot verts, whipped potatoes, truffle duxelles and veal reduction. She had the short rib and absolutely raved over it. I only had one gripe with this place…I happened to check-in via Yelp (as I often do) and found we could get a complimentary dessert. Showing this to the waiter, we were told they “can’t get that off Yelp” and they “can’t honor it.” I would figure after a $220 bill you wouldn’t gripe about $10 piece of cake, sheesh, the food was good nonetheless. We did some kayak fishing in the morning and I caught a huge trunk fish which turned out to be poisonous to humans and inedible, so it was catch and release. 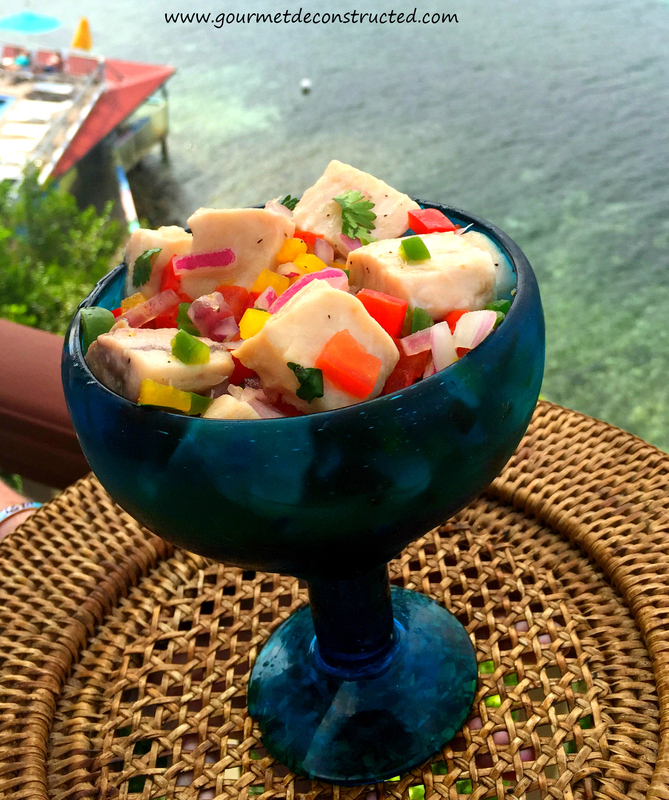 While driving back to the resort there were some local fisherman selling freshly caught fish out of the back of van so we pulled over and purchased some swordfish which I made this ceviche out of (recipe below). That evening at the recommendation of a chef friend we decided to go to Vicar’s Bar & Grill. The restaurant is located on the eastern side of St. Thomas in Pavilions and Pools Villa Hotel This place is described as “Caribbean cuisine with a gourmet flair”. Here is my assessment… the restaurant is located outside in a tent on the property and had no visible netting (or at least not at our table), not a good idea since the U.S.V.I. is a hotbed for mosquitoes. Additionally, the service was painfully, frustratingly slow. It took what seemed like an eternity to refill the water after we requested it. And considering the restaurant is outdoors in the humid air, without insect netting, it did feel like an eternity, sweating and parched. To add insult to injury there was no seafood in the seafood chowder. I’m not exaggerating. There was zero protein in the form of seafood or anything else in the $14 bowl of so called seafood chowder. It was as if they opened some canned seafood broth, added some cream, potatoes, and corn and called it “seafood chowder”. Another thing is that they were out of everything, no lamb, no veal chops, no pork chops which forced us to buy steak, unless we wanted an over-priced 1/2 of a spiny lobster (no thanks). I mean the entrees were very good & tasty, but with the extremely slow staff, island humidity, and insects made us bolt out of this restaurant to take our expensive entrees back to our resort and eat them comfortably. 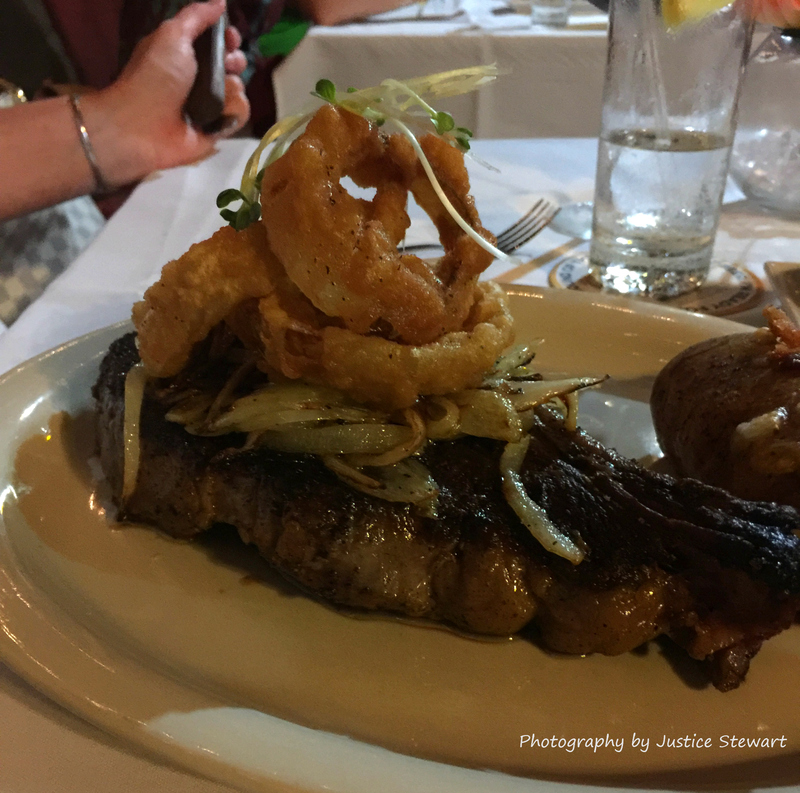 In the owner/chef’s defense, he responded very quickly to my Yelp review (read it here) and offered us a discounted meal if we returned, I appreciated that; an owner that cares about his customer feelings. Vicar’s has since closed it’s doors permanently . 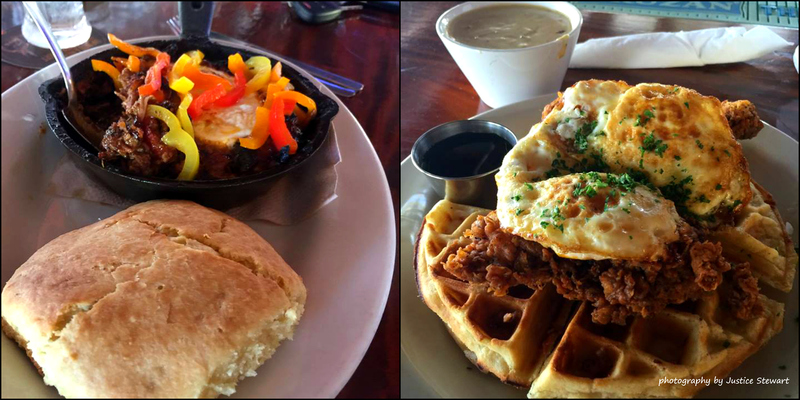 The last day on the island we stopped at The Smoking Rooster restaurant for brunch before our flight and I had some really delicious Chicken and waffles (a taste of home) and Emily had pulled pork belly and egg. The real highlights were the bottomless hibiscus mimosas & spicy bloody Mary’s. It was awesome to have a tasty meal before flying back! I hope you all enjoyed taking this fun foodie trip with me, and I hope you all stay tuned for our next adventure, Enjoy the recipe! In a large stainless steel bowl, combine the fish, lime juice and onion. Use enough juice to cover the fish completely to allow it to cook evenly; too little juice can cooked fish unevenly. Cover and refrigerate for about 4-6 hours, or until a cube of fish no longer looks raw when broken open. Drain the lime juice out through a strainer. In a separate large bowl, mix together the peppers, tomatoes, hot chilies, cilantro, mango, and olive oil; put it in the fridge for an additional hour to allow the flavors to blend. Stir in the fish and season with salt, to taste. Add the juice from the two oranges and stir, cover, and refrigerate if not serving immediately. The ceviche should stay good refrigerated for up to 48 hours. Bon Appetit! Posted on May 31, 2016, in Foodie Road Trips & Other Fun Things, Seafood and tagged airbnb, caribbean cuisine, ceviche, chicken & waffles, cuzzin's caribbean restaurant, fishing, fried fish, lime, mango, mangrove snapper, mussells, old stone farmhouse restaurant, Point pleasant resort, pulled pork belly, red snapper, rib-eye, seafood chowder, Shoreline bar and grille, smoking rooster restaurant, sweet plantains restaurant, swordfish ceviche, tostones, trunk fish, US Virgin Islands, vicar's bar & Grill, waygu steak, Yelp. Bookmark the permalink. 4 Comments. I am following your blog, and wanted to invite you to participate and feature as a Guest poster with us, and share some of your awesome recipes on our blog?